***Each week or two I am going to feature one of Stampin' Up! 's many fabulous products. I'll tell you a little why I think it's so cool, tips & tricks, and, of course, way-cool samples. Most of the time I will be showing items from the current catalog, but I've got some great ideas from their retired catalogs that I simply must show you. So please forgive me for the occassional retired item...like you will see this week. Does the thought of scrapbooking scare you? If you want a quick, foolproof method for saving your special photos, Stampin' Up! 's Simply Scrappin' Kits are just for you! 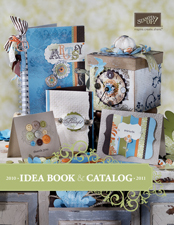 Each set includes 12x12 textured cardstock, 12x12 double-sided patterned paper, and self-adhesive die-cuts. To create scrapbook pages, you just add the photos. The images are all exclusive Stampin' Up! designs that coordinate with their rubber stamp sets. 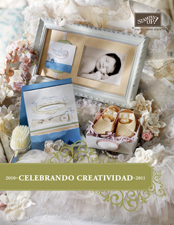 And each package includes several great layout ideas & a few non-scrapbooking ideas. I just love Simply Scrappin' Kits!! You can view them HERE , but be sure to turn the page, so that you can view all 10 Kits, plus the Hostess Benefit Kit "Just 4 You" which you can find HERE. 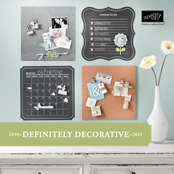 They are so easy to use and can be used for more than just scrapbooking! 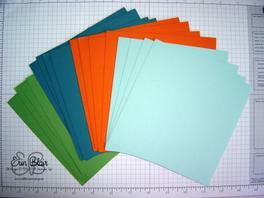 I love using them for quick cards, decorating clipboards, coordinating gift packages, and more. And don't forget that although the cardstock & paper comes in 12x12, you can easily trim it to 8.5 x 11 or 6x6, to suit your scrappin' needs. 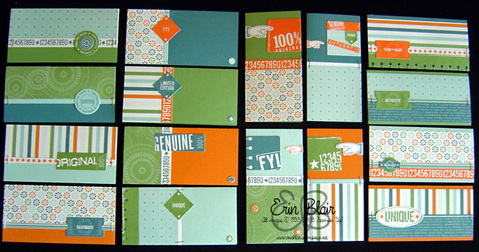 Today, I want to show you some simple "man" cards I made from "Creative License", the Level 1 Hostess Benefit Simply Scrappin' Kit from the 2007 Fall-Winter Collection (read: this is no longer available from Stampin' Up!). I never have enough masculine cards on hand, so I wanted to have a ready supply. I only utilized half of the kit & had lots of left over adhesive die cuts. I hope the following general directions will help explain what I did and how you can use the same directions with just about ANY Simply Scrappin' Kit. 1. Using 4 sheets of 12x12 textured cardstock (one of each color) I cut each sheet into 6x6 squares and then folded them in half to create 3x6 cards which fit perfectly into Stampin' Up! 's Small Open-End Envelopes. 2. Next, I took one sheet of each of the patterned papers, and cut each in half to form two 6x12 sections with each sheet. 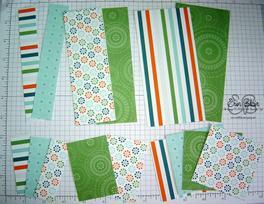 Then, I trimmed only one of each patterned paper's 6x12 sections into 1x6, 2x6, & 3x6 inch sections. With some of the 1, 2, & 3 inch sections, I cut them in half to make 1x3, 2x3, & 3x3 sections. I got this basic cutting idea from Craft Doc. Be sure to check out her cool idea with the Winter Bright Simply Scrappin' Kit. I'll be posting my Winter Bright samples in a couple of days. 3. Then I took the adhesive die-cut sheet that had the 12 inch border strips on them, and cut it in half, so I had 2 six-inch sections. Next, I took one of the 6-inch sections and cut it in half to form 2 three-inch sections. After all that cutting, I had 1 six-inch section and 2 three-inch sections. 4. Finally, let the FUN begin. I noticed with this kit that there were similar images/sayings in different colors. Since I wanted this set of cards to be super simple, I ended up coming up with four different designs. I will post more pictures of these cards tomorrow. Well, I hope you enjoyed this and that you will go pull that Simply Scrappin' Kit out that you've been meaning to use! !